Iconic symbols are a theme I will be referring to often. For example, when you think of Paris, what image comes to mind? Probably the Eiffel Tower. Rome? The Colosseum. London? Big Ben. New York, LA, San Fransisco? The Statue of Liberty, the Hollywood Sign, and the Golden Gate Bridge. I can go on and on about how certain places have certain images associated with them. Sometimes the image isn’t of an object or a building. If you think of Argentina, you think of people doing the tango or of gauchos. What comes to mind when you think of Indonesia? Unless you live there or have visited there, my guess is it isn’t a good image. It is probably one of the earthquakes, landslides or tsunamis. Borobudur and Prambanan have not achieved the level fame of a Taj Mahal or the Great Pyramids, but they probably should be on the short list of the great, ancient places of the world. It was difficult to get the entire structure in my camera, even with a wide angle lens. 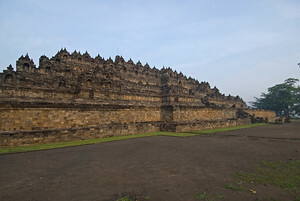 Borobudur is a Buddhist temple in central Java which dates to the year 800. 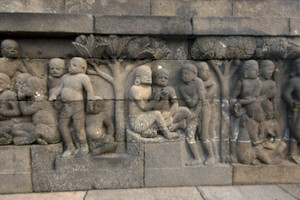 Prior to the introduction of Islam in the 1500’s, Hinduism and Buddhism were the predominant religions in Java. Borobudur was constructed during the Srivijaya Empire which covered all of Java, Sumatra, peninsular Malaysia, and coastal areas of Borneo. It is labeled as the largest single Buddhist temple in the world. Many people think that Angkor Wat is, but that is technically a temple complex. Borobudur is larger than any one temple in Angkor Wat. The architecture of the temple is quite clever and isn’t readily apparent. The temple is built in tiers. The traditional way to go up to the top of the temple is to climb up and walk around each level in a clockwise direction, so the reliefs are on your right. The major divisions of the temple represent parts of the human body (head, body, and feet). Moreover, it was later found to be built in a 9:6:4 ratio, which is used in other Buddhist temples in Asia. In the 90s it was discovered that two other nearby Buddhist temples were in a straight line with Borobudur, making the construction of the temple even more impressive. There is also evidence that there may have been a lake near the temple which was filled with ash in an ancient volcanic eruption. Near the top of the structure are many bell shaped objects called stupas. They contain statues of sitting Buddhas. There is one grand stupa at the top center of the building which does not have a statue inside. My trip to Borobudur started out at 4:30am. I had signed up for the sunrise trip and I was the first person the tour van picked up. In addition to seeing the sunrise, if you arrive early you will not have nearly as many vendors trying to sell you stuff. The size of the vendor area seemed many times the size of the parking lot. Everyone seemed to be selling the exact same things. I’m not sure how anyone was able to make a living selling stuff. I had a bunch of students walking up to me and asking me questions in English. Everyone also wanted to get their photo taken with me (something which happened to me all over Indonesia). It turned out they were there for an English class trip so they could practice speaking English. I was able strike up a conversation with their teachers. They said that Borobudur used to be packed with foreign tourists. Since the 2002 Bali bombing, hardly any foreigners come to Java anymore. Now you will see mostly domestic tourists at Borobudur. That is really a shame because Borobudur and neighboring Prambanan are really the two standout attractions in Indonesia. Hi, my name is yaya. I am study about heritage sites for Borobudur and Prambanan right now. I was wondering before you went to Indonesia Borobudr and Pambanan, where your information comes from was. And where were your information in your blog came from? Were you used the wikitravel or other web site to search your information about Borobudur and Prambanan? And what were you looking for or experience in those two heritage? What’s the most attract you in Borobudur and Prambanan? I really need your information! Thank you for your reply!!! I didn’t really research before i arrived. I went there and learned about it when I was there. I see. So those information was from your tour guide or other person? good for you gary that you got to visit borobudur earlier in the day when tourists haven’t come in yet. it can get SO packed that coming up the flights of stairs becomes perilous. but it is worth the ‘peril’ methinks- don’t you? we came up in one of the ‘side’ entrances, far from the madding crowd, but any side seemed as beautiful as the rest. we didn’t get to visit prambanan because of some earthquake damage which may endanger our lives. but watching ramayana, the romeo-and-juliet SEAsia version with prambanan as the backdrop was just as amazing. safe journeys always! I’ll be writing about Prambanan shortly. I was going to talk about both of them in one post, but it got too long. You can easily do both Prambanan and Borobudur in one day. They are very close to each other. Merapi is easy to see assuming clouds aren’t covering it. I only saw it for 15 minutes on my way out of town. If you are going to Bali, I recommend visiting Bromo on the way. More accessible than Merapi. 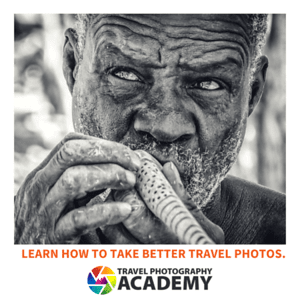 Great travel pictures and narration. I wish I can take a long break and travel like you. Stumbled. 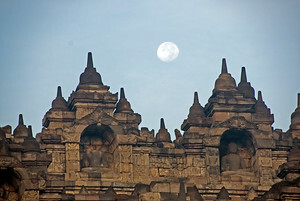 I’m looking forward to Borobudur, it looks like Prambanan is a must see too. What sort of presence does Merapi have in the area? Merapi will be another must for me a good first Volcano I think. Are you still heading to Tasmania? If you are interested in couchsurfing and coming to Hobart I might be able to accommodate. I believe Buddhism came to Java from SE Asia. From some of the research I did, the architecture is similar to what you will find in other SE Asian Buddhist temples from the same period. I have been enjoying your travel blog, it has been intersting, and love the photos. Glad you received your debit card. Perfect timing. Well, This is quite interesting place to visit. Similarly may be some of the connecion between thai culture can be found on land.